Hello and Thank You for checking out our latest Chevrolet Camaro Pace Car for sale by The Motor Masters! You are looking at an Official 1969 Camaro Z11 SS/RS Indy 500 Pace Car! 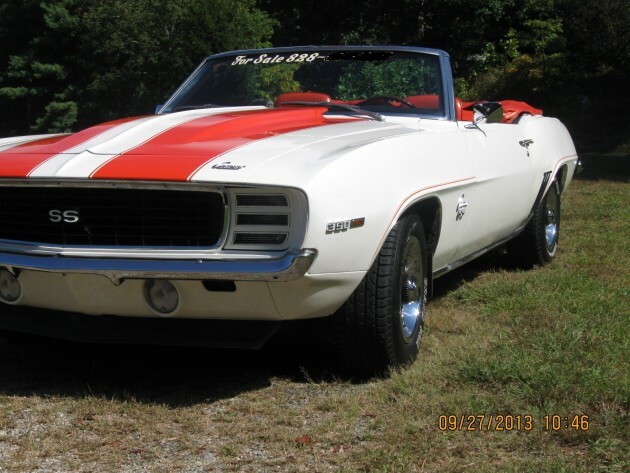 This is a Consignment Classic Car brought to us by a personal friend who is a proud Vietnam Veteran!! Mileage on this vehicle is 27,153. The Camaro went through a Full Restoration in 1998. Stock Engine was replaced with a 350 CI High Performance Engine With Aluminum Heads, Edelbrock Intake, and 4BBL Carburetor. Equipment included: Z-22 Rally Sports Package, Z-L2 Air Induction Hood, D-80 Spoiler Equipment, M-21 Muncie 4 Speed Transmission, and Hurst Shifter Linkage. Has Power Windows, Cruise Control, Alarm Speed Control, Factory Blue Dot AM/FM Radio, Factory AC, Factory Rally Wheels, and Convertible Top. This Camaro was 1 of 3674 Built with a Build Date of December 1968. Body is in EXTREMELY GOOD SHAPE. Paint is GOOD…has a few minor chips. Always Garaged when parked. This is also insured by Hagerty for $51,000. We have a copy of the Hagerty Insurance if anyone would like an emailed copy, as well as other documentation. BUY WITH CONFIDENCE!!! WE HAVE A 100% POSITIVE FEEDBACK RATING BY ALL OF OUR CUSTOMERS!!!!! So if you are looking for a quality Chevrolet Camaro Pace Car for sale, you have found it. It’s gone through a ground up restoration. The new owner will be happy to own this. This one won;t last long so give us a call TODAY!